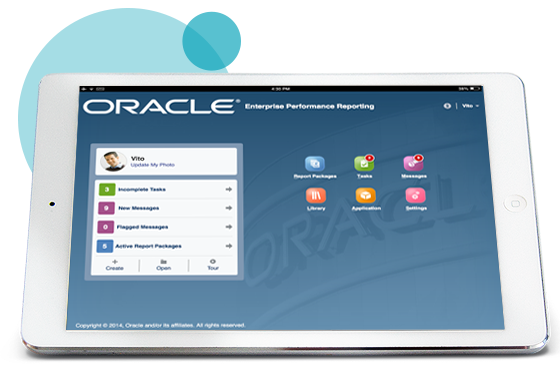 Oracle Enterprise Performance Reporting Cloud combines data and narrative, providing a single web interface for report package contributors. Report package owners define, manage, monitor and interact with content through this interface, while assigned users see only the content applicable to the role they have been assigned. In addition, users can easily take a deeper dive into the data without leaving the application. Oracle Enterprise Performance Reporting Cloud includes the ability to perform multi-dimensional and other analysis on financial data. The solution enables business users to participate in the narrative reporting process through the web interface on a variety of devices, including desktops and tablets. Collaboration throughout the process is key to getting the most accurate picture possible, and helps shrink the time it takes to define, produce and deliver reports. Increased demand, both internally and externally, for information, plus many data sources can make it challenging to have confidence in the results reported. Oracle Enterprise Performance Reporting Cloud enables you to easily combine system of record data into your narrative reporting. Authors can integrate both on-premises and cloud-based EPM and BI data sources directly, as well as integrate data from Oracle and other ERP systems, thereby leveraging existing IT investments. This helps provide trust and reliability that the numbers and information are accurate.